AFTrack is the display for your GPS and brings the world of hiking, biking, sailing, geocaching and more to your phone. The program handles tracking with smart and fixed logging features. It sends reports online or via SMS. It receives SMS position messages and shows it as way points. It exports tracks and way points, uses maps online and offline and much more. The map view can contain some additional data in a dock. Maps are used online or offline (online maps need a net connection). Parts of an online map are stored on the sdcard to prevent the need for too much data (or bandwidth). You may define your own entries in the map definition file (maps.xml is found in sdcard/data/aftrack/conf). Zoom level goes from 2 to 17. If the selected map doesn't deliver tiles for the current area you can define a fall back map server. Offline maps have to be made in order to use them. Use tools like the MobileAtlasCreator to get some maps for your area. Files with approximately 5000 tiles are useful. MobileAtlasCreator, since version 1.8a7, generates files with tiles packed in a OSZ file (just a zip file with the downloads and a calibration info file). Place the files on your favorite directory and load it into AFTrack at the map list. Offline maps without zoom level can be imported from jpg, bmp or png format. They can be combined with calibration files in map, gmi, kml, kal or jpr format. The name of calibration and bitmap file has to be the same. Note: A bitmap is stored completely in memory, so the hardware determines, how big can the map (size = X x Y x 4 bytes). Maps with tfw calibration are stored as UTM coordinates without zone information - most times. So please place the map window near to the map before you import it. When you are working with different maps for the same area and you don't want to switch to an other map when zooming, please uncheck 'Auto map' in map settings. See OSM-wiki for more online references. It is possible to use the online overlays from the OpenSeaMap project with a standard tile server. Or download a part of OpenSeaMap for direct use. Nautical maps are also useable but they need a registration with the CD key. The best way is to copy the map files into a folder (e.g. bsbroot/baltic_1) and scan the directory and the sub folders. When you also copy the data folder from your chartkit to the sd-card, then the nautical information is loaded into the database with the scan process. Copy the charts from PC map directory (e.g. C:\Chartkit\Bsbchart to sd card /maps/ BSBroot). In addition the NV database is required (e.g. C:\Program Files (x86)\NV-Digital\filedatabase.nvdb to sd card /maps/bsbchart). When the chartkit 'data' folder is moved to the phone, the nautical information is written to the database (e.g. C:\Chartkit\Bsbchart\data to /maps/BSBroot/data). The charts are copied from CD (e.g.? :\nvinst\charts to sd card /maps/BSBroot). Make sure that the file installdata.txt is also copied. I recommend for each CD a subdirectory (e.g. /maps/bsbchart/baltic_1). The copy of the nautical information is different. See the CD folder ? :\nvinst\data and copy the folder Moorings to /maps/BSBroot/data/Moorings. also move the content of the folder DE (or other language) to /maps/BSBroot/data. For an update copy the charts again to the phone and over write the old ones. Then do a new scan (found in map settings). On a phone also use a zip manager (eg xzip, open as archive). AFTrack can not organize this new database type but if you have installed the NV charts app the charts are readable in AFTrack. Just do a scan and use it. Offline vector maps from mapsforge project. This can be used with the original maps on the mapsforge download or the maps from openandromaps but to get the full features (coast line, contour lines) of these maps you will need to load the included theme file. Just copy one of the xml layouts to the phone and select it in map settings. When the xml layout contains local referenced pattern this is also loaded (see as sample the Elevate - Mountain Hike Theme - just copy xml and folder to phone). You also may use the Elevate 4 version with new features for the maps styling. To get the language support you have to load a map that carries this information e.g. from openandromaps. On the phone you may install a theme via the OruxMap or the BackCountry Nav button. Or the manualy way. Use the map selector on top for a quick switch between the available maps at your position (yellow = current map, dark grey = online map). When online maps are allowed, then the first selector switches to the online map. In AFTrack visit the map list. The third button is the downloader. Choose Mapsforge or OpenAndroMaps and select your favorite chart for download. It will take some time - OpenAndroMaps needs an unzip process at the end. Then you will find a new map in your map list. OpenAndroMaps has some links for overview maps - not in mapsforge format, but very useful. Start with the import of a bitmap e.g. a picture you made. Select another map to assist you on the calibration process e.g. a satellite view for the area you want to calibrate. In the map list you will see the map with a (nc) sign - which means no calibration. With a long press on the list entry you can start the calibration. In the center you have the current xy position on your map. You can move it to a point you need and then start with first button (plus). This adds a calibration point. there are two ways to work with this point. - When you tap on the point you can edit the points coordinates or drop the point. - Or you select the rectangle button to see the underlaying map. Now move to the corresponding xy position to your point and say add (plus button). The underlaying map must be in the area of your new map. If the 'auto map' mode is selected in the map settings, the program will select the next map for the current area from the list. When there are more than one available it's always the first. To see the selected offline map, just deselect 'auto map'. Note: 'auto map' always selects the best scaling map. So if you use different map systems, it will be better to switch off the 'auto map' function. E.g. you hold a set of BSB sea maps (which have no zooming) and a mapsforge map (zooms from level 2 to 22 ) in the same area. So it could be good idea to hold both in different folders, drop the map list when you want to use a special map system and rescan the folder for it. For BSB nautical charts 'auto map' means, if off is selected, that the map is shown inclusive with the border and nautical information. Otherwise the map is clipped by the polyline and the next larger map is shown as background. Overlays are displayed on top of the current map. There are four samples for online overlays (only visible where data is available). Define others in the conf file 'overlay.xml'. For offline overlays use the mbtiles database format and the type 'overlay'. To see how to generate this please see here. Offline overlays are loaded as the other maps. They are marked with a (o) behind the name. They are found behind the overlay button on the main map view. The host definition of the overlay need a refresh sometimes. Here is the last version overlays.xml. The transparency for overlays is adjustable. When using mapsforge latest layouts you will also find there a layout entry to define your favorite layout elements.Download the plain sqlitedb version. Tracks are managed in the track list and some settings in the GPS settings. Export it from the list by hold the list entry for a longer time. Exports can be made to GPX, KML, OVL or IGC format. IGC format needs some settings to be done to get your personal values out. When depth values are available, they are stored to the gpx export. It is also possible to collect a track from the incoming short messages, this can work as single or multi tracking. Colors for multi tracking are placed in the folder aftrack/conf (file trackcolors.txt). Each track point can be send as short message or HTTP message immediately after generation. Routes are useful to show on the map or to guide you to your targets. Unlike street routing, it only works with a line. Corridor routing helps you to stay inside a routing area and warns you when you move outside. Define the routing alarm distance to get the desired size. To design a new route or area see this video. 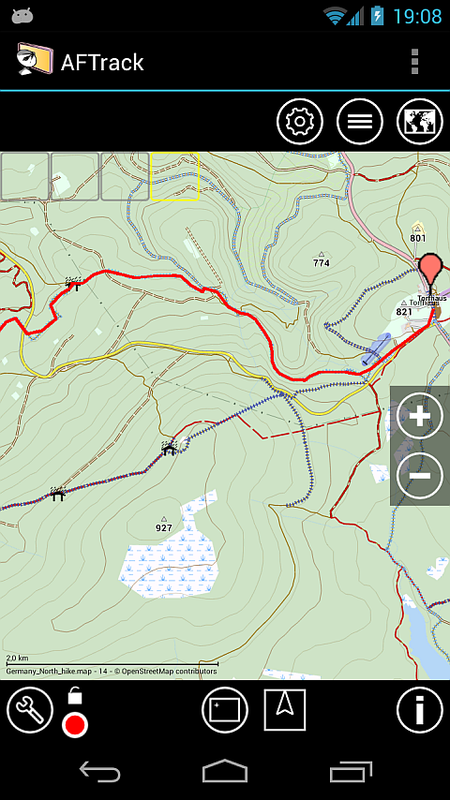 In AFTrack select the line button - visible on a long press on the map. You will see 2 points and a line. Define your route points and select the route button to get a list with the options to walk, bike or drive. Then press the search button to get a new route. You can save it by the ok button or leave the routing dialog. For wind routing visit the display settings and activate the wind info and the wind routing box. When the wind gauge is visible you can tap on it to get a wind info, This normally shows the weather info from the next weather station. By select 'internal' the wind gauge shows the wind coming from NMEA data ($--MVR, $--MWD, $--MWV). There is a special plugin for the SailTimer Wind Instrument™. It gets wind values via Bluetooth LowEnergy. In GoTo mode the tacking lines are shown from position to the point. This is also used to get the distance to destination. The starting line for this is drawn in the background to remember the plan. A corridor routing is also available to see if the course is still in a defined range. 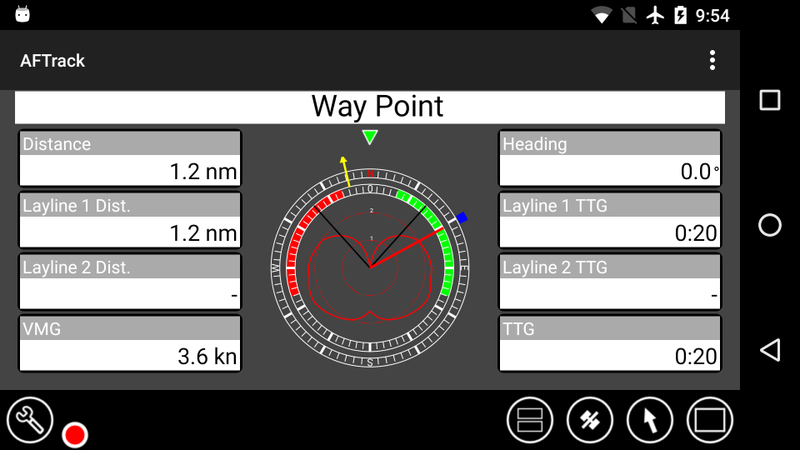 In route planning mode the wind lines are shown from point to point and the resulting distance is displayed using wind information. Nevertheless only the points are saved without wind information. In routing mode the tacking lines are shown for the first point. There are small boat settings (in the wind section of display settings). For now the best angle to the wind is saved and used for calculations. The best speed is only used when no other speed information is available. It is also possible to activate polar data for the speed calculation. In the GoTo view there is a wind gauge when wind routing is active. To design a route with wind, see video. Import an area in the KML format. It can be displayed in different colors. The transparency for areas is adjustable. Way points are organized in groups. So define your special interest group and add some points to it. Use the import of GPS or KML formatted files or add the point from your gps signal. It is possible to set an anchor alarm to a way point when you receive short messages for it. Format must be PNG. The icon names are synchrone to the GPX "sym" or "groundspeak:type" tag. It is possible to insert a group of way points in one step (collection). This option must be defined in display settings. There is a text file in sdcard/data/aftrack/conf to define the way points needed for the collection. Select a group of points and press the import button (arrow down). The points will get the icon from the group. By default the location settings of the system are used. When tracks are recorded, it is recommended to switch off the network location. Install an extra Bluetooth gps provider from the store. Start with a pairing of the phone and the gps in the bluetooth settings. Start the new provider app and select the pairing parameters. Then the connection can start. AFTrack will use this position now. Pair the hardware as before. Select the bluetooth option in the gps settings and then a hardware from the device list. Use AFTrack as a GPSD and make your position available to a PC or tablet without gps. Short message reporting can be done manually or parallel to a track. This needs some settings first. Incoming messages are checked for gps sentences which are processed if found. Since Android KitKat AFTrack can't delete an incoming sms, so you could set it with a sms provider. AFTrack also receive SMS reports (select GGA mode) from other AFTrack users and store the incoming values as waypoints. For the name of the waypoint the phone book entry is used - if not already there. It is possible to receive the GPS tracker TK102, TK102-2, TK102 clones, DNT, ELRO, GEODOG or SmartcomGps. For special functions, there exists a template to individualize the sending text (template sms.txt is found in AFTrack directory conf). It contains the all available shortcuts to fill into the message (latitude, longitude, altitude, date, time, speed, direction and the address for the position - if internet connected). If you miss starting a track on incoming position reports then you can move the history of sms to a track - you will find this on the context menu of the way point entry. The receive function can be used as an anchor alarm. Leave a gps tracker (or a second AFTrack version) on board and set an anchor alarm for its way point. The collar responds with a ready message. After the command is confirmed, the mode is activated by a 3 second press on the home button. PLEASE NOTE: GPS and the Home button indicator will flash. It hs now made a new GPS fix. Once the fix has been made ​​ successfully both lamps shown permanently. From this point on, the collar sends positions for the last 30 seconds in a 5 block format. The transmission mode is switched off with a short press on the home button. WARNING: if the collar runs longer than 30 seconds the display goes to "sleep mode". Before switching off do a short push on the 'on / off' button. If no network connection is available, the tracking data are buffered and sent out later if this is possible. Online reporting means sending your position to a web site. This can be done in a single step or automatically with the log. There is a default setting for www.whererya.com. It can be done automatically with the logging function or manually from the menu. It's also possible to share your position using other apps. Geo id is calculated with formulas and values from National Geospatial-Intelligence Agency (NGA). There is also an option to define a group of AIS items and display it in different color. Design a text file with name 'aisgroup.txt' and place it into the AFTrack 'conf' folder. These settings are for getting way point positions from a server. Before start a GpsGate connection fill the settings for the server. Different profiles can be created. This helps you to send positions to a server. Fill in all the values you need to connect a server. This can be done in user profiles. So it's easy to switch to other server settings. There is an option to connect the server parallel to the logging. Plugins are program parts of AFTrack that comes in an extra app container. This saves space for the main app and not all users will need it. They are not visible in a app launcher but in system settings dialog for apps. Short Message applications can interfere with the reception of SMS if they occupy the inbox. and the custom ROM 'MIUI'. Since verson M on some Samsung devices the gps logging is broken when in Doze mode. Visit system settings battery and select battery optimization. Now select AFTrack and set it to not opimized. Sometimes only a complete turn off for battery saving helps.